Vaccines are a very valuable tool to aid in the prevention and control of disease, but in some cases, they can prove to be harmful to some equine patients. In looking at the big picture, your job as a horse owner is to provide the best level of healthcare possible but caution should be taken in certain situations. No two horses are alike, just like no two people are alike. Those two horses may look similar, but internally there is going to be some variation, which needs to be taken into consideration. Vaccines should be used, but some considerations are needed to keep potential negative effects to a minimum. It is spring time and your barn is being scheduled for vaccinations by your veterinarian. It’s a routine that is done every year, if not twice a year and something familiar to most horse owners. It is a routine, but is always the right thing to do? In some situations, it is required, such as in a boarding facility or prior to a competition. Even though. . . is it right for every horse and in every situation? Vaccines were created to prevent and minimize disease, by reducing morbidity and mortality. They are not 100% effective in all cases, and in many instances, the vaccines do not reduce the incidence of disease but they do reduce morbidity. A case in point is the influenza or flu vaccine. This vaccine does not eradicate the disease, nor does the administration of the vaccine mean that you, your horse, or your dog will not acquire the infection. 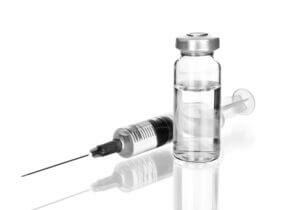 What the use of the vaccine does generally do is enhance the immune response of the patient, so that when the virus is encountered, the attack mounted is not detrimental to the patient. Many horses and people vaccinated against influenza still do contract the viral infection, but the infection does not hit them as hard. They don’t get as sick as someone that has not had the vaccine. However, this is not always true, as we will discuss. Vaccines are generally targeting viral infections, while there are some on the market for bacterial conditions in the horse, with Strangles as a case example. Those vaccines targeted against viral infections tend to create a stronger host response compared to those bacterial vaccines. The viral vaccines also tend to have a longer response in the patient, requiring lower frequency of administration. Bacterial based vaccines are the opposite, which is why the Strangles vaccine is given prior to events, and boostered often through the year. The same holds for the vaccine against PHF or Potomac Horse Fever. When it comes to equine vaccines, they do help to prevent many clinical diseases in the horse, but not every horse is the same. When trying to establish a vaccine protocol there are a few things that you need to keep in mind. Risk factors associated with the particular horse which includes housing, exposure to other horses, their environment, age, health status, and geographic location. Impact of the particular disease you are targeting, including morbidity/mortality and risk of spread to other horses and species. Regarding vaccines, we have the “Core” and the “Risk Based” vaccines. These vaccines can be given once annually, or sometimes quarterly, all dependent on the schedule determined by your veterinarian and risk perceived to the horse. Equine Vaccines. To Vaccinate or Not Vaccinate? Vaccines were created with a purpose and in many conditions, you, as the horse owner believe that you do not have a choice in the matter. Actually, you do have more choice than what you think. A high percentage of horses can receive a potpourri of vaccines in a given setting and do just fine, at least in the short term. On the other hand, there are many horses that receive their vaccines and experience bouts of laminitic pain or allergic reactions. This is the difference that exists between horses and why no two horses should be treated identically. The fact is that many horses are experiencing primary inflammatory conditions in their daily lives, which may or may not be apparent. For some, maybe they are recovering from an injury or experiencing stress, while others may have a history of uveitis, allergies, metabolic syndrome, insulin resistance, or laminitis. These are all inflammatory conditions, and no matter how well under control you believe they are, that horse likely has higher levels of inflammation than the average horse. Think of it like them having a glowing pile of embers in their body. That is the inflammation. When you vaccinate, you are creating an immune response, which equates to inflammation. It is like pouring gasoline on those glowing pile of embers. You ignite the underlying condition, which is why many owners experience post vaccine inflammatory events such as laminitic and allergy flare ups. Taking this into consideration, some horses shouldn’t be vaccinated at all or at least have a delay if their current health status is in question. In fact, in my personal horses and many others, I will split up vaccines, given a few antigens today and then the remainders in two weeks. This is done regardless of the health status of the horse, and I believe it helps to reduce the antigenic stimulation. This then helps us to promote overall health in the horse. In many of our horses, who have very low risk of contracting disease, I will just administer the Rabies and Tetanus vaccines, separated by 2 weeks. These two vaccines are chosen because of high morbidity and mortality, if those either of those two diseases are contracted. There is no treatment and prognosis is very poor. In other horses, I will often give Eastern, Western Encephalitis along with Rabies in one visit. Then, in the next visit, I will give Tetanus along with Influenza/Herpes vaccine. This is my core for most horses, but other antigens will be added to the protocol if needed or dictated. In the end, vaccines are a necessary thing to help protect and promote your horse’s health, however, not every vaccine is appropriate for every horse, every time. Take a good look at your horse and weigh the factors carefully. If you are required to obtain all vaccine antigens by your boarding facility or otherwise, keep in mind that you can accomplish this and lower risk by splitting up vaccine antigens. This is done by simply requesting it from your veterinarian.